Earlier this month, Nintendo released “Super Mario Party,” the 16th game released in the “Mario Party” franchise. The game loosely follows the gameplay model of earlier installments in the series, which are essentially digital board games designed to be played by sizable groups of players. “Super Mario Party” ditches the car mechanic that Nintendo experimented with in the past couple of mainline “Mario Party” games, returning to the classic board game style of the older games in the series. The return to a more traditional form is much appreciated, though the general playing experience is lacking in several areas. With only four independent boards, a small handful of items, only a few dozen mini-games and relatively few board events, “Super Mario Party” has much less going for it in terms of quantity than any “Mario Party” game in the past. Though “Super Mario Party” features several modes of play, it does not feature a dedicated story mode. This is bound to be a disappointment to fans of the “Mario Party” series, though there is still something of a story woven into the presentation of the game. Additionally, fans of the series will likely feel that the general item balancing in the game is not handled well, with several items being unreasonably powerful. Additionally, the pricing is often too inexpensive for how powerful some of the items can be; effects which might have cost 30 coins in past entries now cost only 10 and stars themselves cost half of what they normally did in the past. These changes make turn-to-turn action quicker though less meaningful and impactful. One thing that didn’t need changing at all in the past games was the menuing, so it was a surprise to see that it had changed to a slower hub world-style menu which only seems to serve to make starting up a game more difficult and time consuming. In terms of mini-games, the chance-dependent mini-games in “Super Mario Party” are far less balanced and far less enjoyable than in past entries — one in particular, “Don’t Wake Wiggler,” is enough to make the player question whether the developers have actually played some of them. Conversely, the skill-based mini-games are some of the most balanced and easy to understand of the franchise. 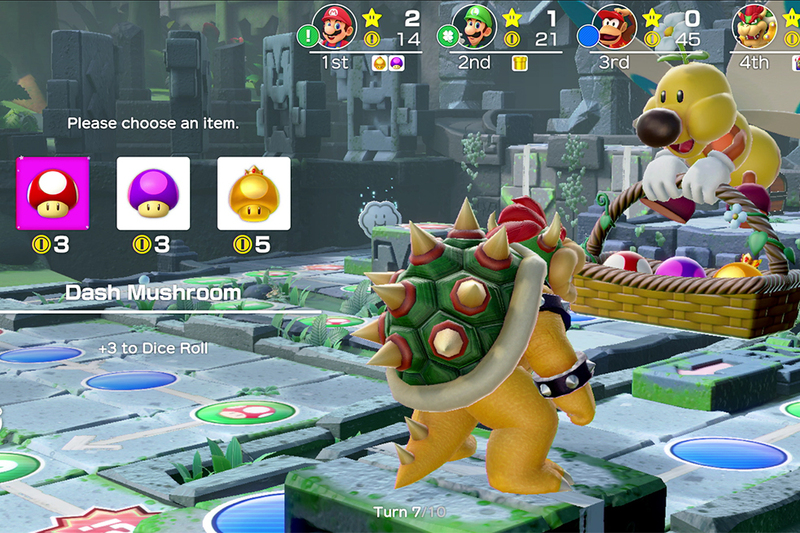 One of the main draws to “Super Mario Party” is its character-specific dice mechanic. Each of the 20 playable characters in “Super Mario Party” may use a unique dice block on every turn, in place of the regular dice block. Unfortunately, not all dice blocks are created equal. Certain blocks offer clear advantages over others, and before long players find themselves selecting characters with certain dice blocks to maximize control over rolls. While this dice mechanic is an interesting and unique feature, it is certainly not balanced. If it seems doubtful that the character chosen in “Super Mario Party” has a significant impact on one’s ability to succeed, one needs only search for the “Super Mario Party” tier list which is already circulating. Another unique mechanic introduced in “Super Mario Party” is the ability to recruit allies. Allies roll a special dice block in addition to the player’s roll, which allows the player to advance more spaces than normal. When an ally is recruited, the player may choose to roll the ally’s special dice block on each turn from then on. In addition, allies may help the player during certain mini-games. Unlike character dice blocks, which each come with strengths and weaknesses, allies are practically only ever a benefit to the player. Due to the more linear flow of game boards, the ability to travel quickly is more important in “Super Mario Party” than in past titles; therefore, recruiting allies quickly is a must and may even be more beneficial in the early stage of the game than collecting stars. After playing several rounds of “Super Mario Party”’s main game mode, Party Mode, the player begins to feel that the smaller, more linear boards in the newest entry to the “Mario Party” series have strayed from the style of past entries in ways that often are not improvements. The smaller, tighter boards seem rife with the possibility of engaging opponents frequently in 1-v-1 “duel” battles à la “Mario Party 5” or bulldozing through opponents with some kind of special item — e.g. Bowlo Candy from “Mario Party 8”. The idea of hindering opponents by passing is toyed with minimally in the game’s Partner Party mode, in which two teams of two players must work together; in this mode, passing opponents allows one to steal coins from them, which can be helpful. Despite the variety in characters and the change-ups to the board for Partner Party, the player cannot help but feel that there simply are not enough boards, items and events to keep Party Mode fresh after several play sessions. While Party Mode is less than ideal, the new game does have redeeming qualities. Though Party Mode is the most important mode for a “Mario Party” game, it is not the only one, and several game modes are enjoyable, and fans should not lose hope. The mode that is likely to prove most divisive for fans is River Survival, in which a team of four players attempt to work together to get to the end of a rafting-themed obstacle course while playing mini-games unique to the mode; while it provides a break from the competitive modes, its short supply of four-player co-op mini-games begins to drain from the experience. “Super Mario Party” has also brought back Mario-thon, a game mode in which players compete to increase running score totals through a set of skill-based mini-games; this game mode is a fan favorite and practically carries the entire game on its own. In general, “Super Mario Party” is an enjoyable game which revives some of the best parts of the older games and is worth checking out. Its unique gimmicks give it its own identity, though players will wish there were more boards, mini-games and items to help keep the intrigue going. Fans should not be put off by the criticisms put forth here —”Super Mario Party” will deliver a fun time. It is a “Mario Party” game, after all.